You yourself are the shadow if only you could perceive it! He also said, may Allah be pleased with him, “One night I had a vision in which I was in the ceelstial realm, when there appeared to me a dark-skinned man of short stature with a large beard. He said to me, ‘Say: O Allah, forgive Muhammad’s (s.a.w.) people. O Allah, have mercy upon Muhammad’s (s.a.w.) people. O Allah, cast Your veil of protection over Muhammad’s (s.a.w.) people. O Allah, restore Muhammad’s (s.a.w.) people. This is the prayer of al-Khidr a.s.. Whoever utters it everyday will be counted among the substitutes (al-abdaal, a category of Saints). 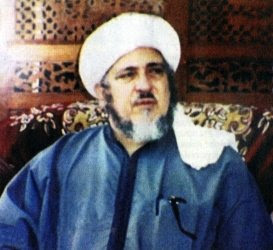 “The weak person is the one with neither faith nor consciousness of Allah” -Shaykh Abu al-Abbas. The Shaykh was afflicted with a number of illnesses which, if even some of them were placed on the mountains, would cause them to melt away. He had kidney stones, suffered pain from his kidney when the weather was cold, and had twelve hemorrhoids which caused him particular discomfort when he was sitting with others. However, he would not interrrupt a session or moan as he sat. Hence those who were with him would not even be aware that there was anything wron with him.